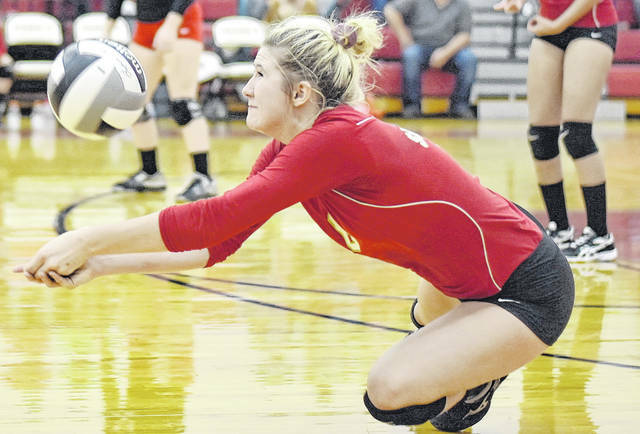 SGHS senior Rachal Colburn (6) attempts a dig during the Lady Rebels victory over the Lady Lancers on Sep. 17 in Gallia County. A total of 12 people — 11 players and one coach — were named to the Division IV All-District 13 volleyball teams, as selected by the coaches within the district. Eastern, a district finalist, finished with a 19-6 record and had six representatives on the Division IV list, which also featured a three of Lady Tornadoes, who finished the year with a 6-16 record. South Gallia picked also had three selections after a 7-10 campaign. EHS head coach Mykala Sheppard was named Division IV Coach of the Year in her first season at the helm of the Lady Eagles. Eastern senior Allison Barber – who was an honorable mention selection last season – was named a first team honoree. EHS junior Caterina Miecchi also received first team honors, while sophomores Olivia Barber, Kelsey Casto and Sydney Sanders each were named honorable mention selections. Southern junior Baylee Wolfe also earned her second all-district nod, being selected as second team, after being an honorable mention awardee a year ago. SHS senior Marissa Brooker and junior Phoenix Cleland each earned honorable mention nods as first time selections. South Gallia senior Rachal Colburn is the lone repeat selection for the Lady Rebels, being named to the second team for the second straight season. SGHS juniors Amaya Howell and Christine Griffith were both first time selections on the honorable mention list. Josie Perani, Miller; Haley Klintsworth, Waterford; Kim Barker, Waterford; Josie Crabtree; Caterina Miecchi, Eastern; Taya Lackey, Trimble; Jaylen Rogers, Federal Hocking; Alex Teters, Waterford; Allison Barber, Eastern; Lindsey Parsons, Federal Hocking. Offensive Player of the Year: Josie Perani, Miller. Defensive Player of the Year: Kim Barker, Waterford. District 13 State Representative: Haley Klintworth, Waterford. Coach of the Year: Mykala Sheppard, Eastern. Hallie Joseph, Miller; Rachal Colburn, South Gallia; Alex Holtzapfel, Saint Joseph; Macinsey Cooper, Trimble; Alyssa Hutchinson, Belpre; Erica Ross, Symmes Valley; Baylee Wolfe, Southern. Marissa Brooker, Southern; Phoneix Cleland, Southern; Denise Young, Waterford; Cara Taylor, Waterford; Ana-Sophia Beardsley, Waterford; Sydeny Spencer, Belpre; Abbey LaFatch, Belpre; Makayla Bowen, Federal Hocking; Kendra Tabler, Federal Hocking; Payton Hunter, Symmes Valley; Morgan Jenkins, Symmes Valley; Rachael Hayes, Symmes Valley; Brooklyn Wilson, Miller; Taylor Hinkle, Miller; Alaina Boyden, Miller; Kelsey Malone, Saint Joe; Bre Wilds, Saint Joe; Grace Miller, Saint Joe; Kaitlyn Sheridan, St Joe; Olivia Barber, Eastern; Kelsey Casto, Eastern; Sydney Sanders, Eastern; Amaya Howell, South Gallia; Christine Griffith, South Gallia; Laikyn Imler, Trimble; Laura York, Trimble; Krislyn Moore, Trimble.